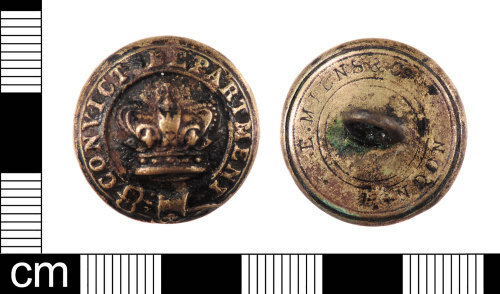 A complete Post Medieval to Modern copper alloy three part button from a prison warders uniform dating from AD 1860-1902. This button is domed at the front and flat at the back. The pressed design at the front consists of a central royal crown with CONVICT DEPARTMENT around. The reverse of the button has the uniform outfitters name E MILNS & Co LONDON. The copper alloy wire loop is present. Dimensions: diameter: 23.08mm; weight: 5.39g. During the 19th century and the beginning of the 20th century prisons were formed of two departments, the Prison Department and the Convict Department. A similar button on the database is IOW-97992.